Choosing a pet can be a difficult task, especially when taking into account your lifestyle, work hours, and the time and energy you’ll have to put into caring for your furry friend. When taking these factors into consideration, you may realize you don’t have time to run home on your lunch break to take a puppy out for a potty break, or the energy to give a cat the playtime it needs. If you’re in this pet predicament, worry no more! Birds are some of the most loving and rewarding pets around. Although they require less work, birds can be just as social, interactive, and comforting as dogs or cats. One of the benefits of becoming a bird owner is that they come in a variety of different standards to fit your individual needs. To find the bird best suited to you and your lifestyle, check out our list of the best birds for pets. Cockatiels are amongst the best birds for pets if you enjoy social interaction with your pet. Charming and outgoing, the cockatiel is a hands-on bird that enjoys playtime, both with its owner and alone. Put a mirror in front of your cockatiel or leave toys in its cage, and it will entertain itself – and you – for hours! Cockatiels are also one of the most affectionate birds. If given the proper attention and care, the cockatiel will form a strong bond with its caregiver. They show affection by perching on the shoulders of their owner and allowing you to caress their feathers, making them a delightful and friendly pet for both kids and adults. All around, the cockatiel is a loving, friendly, and social bird that any pet owner can enjoy. IDEAL FOR: Families, independent pet owners, first-time bird owners looking to bond and interact with their pet bird. Parakeets are ideal if you want to show off your feathery friend! Parakeets love to interact with their human counterparts and are quick to learn tricks, such as climbing up ladders, walking down slides, and hopping through hoops or toilet paper rolls. You can even train your parakeet to fly to you and perch on your finger or shoulder. Smaller than the cockatiel, the parakeet requires little in-home space for its cage, and makes for an easy travel companion. However, don’t let their size fool you – these tiny, high-energy birds have big personalities and are eager to spend some quality hangout time with their caregivers. IDEAL FOR: Families, independent pet owners, and first-time bird owners looking for a friendly, fun, and space-saving pet; pet owners who want to teach tricks to their bird. Lovebirds are the best birds for pets if you want to form a loving bond with your bird. True to their name, lovebirds are small, colorful parrots that are devoted to their owners. They enjoy playing with toys and can entertain themselves for hours. However, spending quality time with your lovebird should prove rewarding, as these birds develop a connection to their caregiver, and may even become jealous towards others who rival for your attention. Lovebirds love to hang out, snuggle, and ride around on their owner’s shoulders. The lovebird’s fun and lively personality makes for an exciting and enjoyable pet. IDEAL FOR: Families or independent pet owners wanting to interact and form a strong bond with their bird. Looking for a low-maintenance and independent bird? You might prefer a finch. Finches are small birds that are easy to care for. They are energetic and tend to prefer socializing with their kind rather than with their caregiver, so it’s best to buy finches in pairs. They are also quiet birds that make pleasant little chirping sounds. IDEAL FOR: Pet owners who live in small spaces, work long hours, or prefer a happily independent and low-maintenance pet. Canaries are the best birds for pets if you enjoy a beautiful, low maintenance, and sophisticated bird. Canaries are delightful birds that are known for their outstanding coloring and ability to sing. 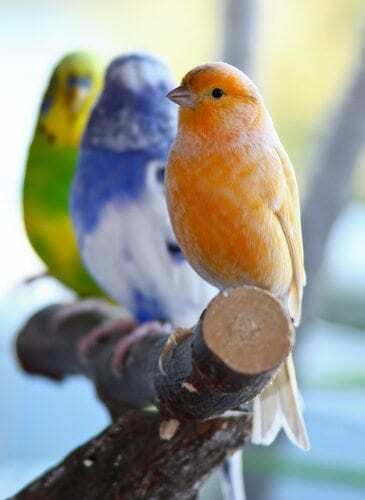 Although many recognize the canary’s trademark yellow coloring, canaries come in a variety of magnificent colors. There are various types of canaries, but the males of each type will produce lovely melodies and great entertainment in the home. Canaries are friendly and enjoy the company of their owner but are solitary by nature, making them ideal birds for owners who enjoy both interaction from their pet and independence. IDEAL FOR: Pet owners looking for a low-maintenance, interactive, and independent bird. Parrots can make wonderful companions. They are highly intelligent and thus highly trainable, but they also require a lot of attention and mental stimulation. With proper socialization, they can be very affectionate, and no one can deny their eye-catching beauty. However, parrots sometimes exhibit aggression and their voices are quite loud, so we don’t recommend them for beginners or apartment dwellers. If you’re an experienced bird owner and you’re excited to spend a lot of quality time with your new pet, explore the many types of parrots available, including Sun Conures, Jenday Conures, and Green Cheeks. IDEAL FOR: Experienced pet owners looking for an intelligent, beautiful bird. Once you decide on the perfect bird to become the next addition to your family, head over to your local Petsway if you live in Missouri. 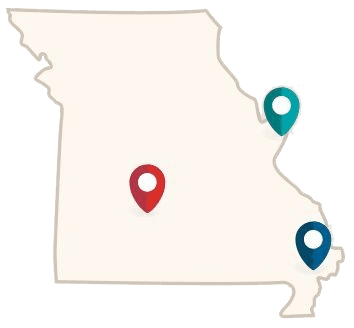 We have locations in Springfield, Nixa, St. Louis, St. Peters, and Poplar Bluff, and you can find store hours and addresses on our website. Our knowledgeable associates would be happy to help you select a bird, and we can also assist you in preparing your home to welcome your new feathery friend.